Vamana Jayanti is dedicated to the Vamana Avatar of Hindu God Vishnu. 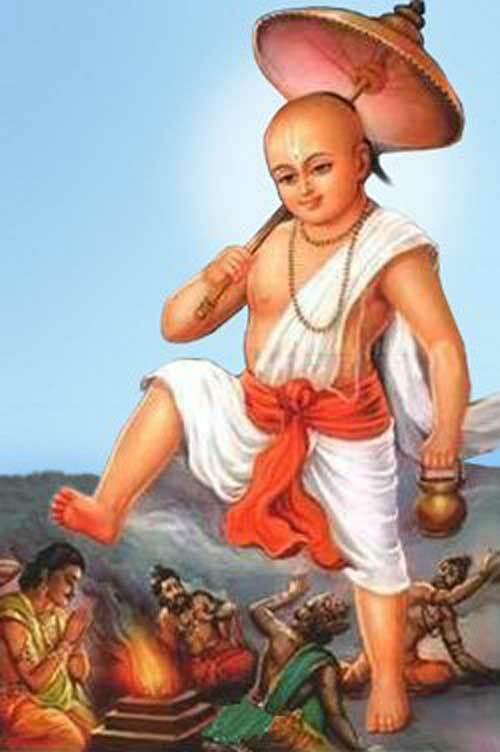 It is believed that Vaman (the dwarf) incarnation appeared on earth on Vaman Jayanti day. Vamana Jayanti 2019 date is September 10. Annually it is observed on the 12th day of the Shukla Paksha of Bhadrapad month – 12th day of the waxing phase of moon. Vamana appeared on earth to give moksha to Asura King Bali and also help Devas (Demi gods) who had lost their power to King Bali. Performing the puja earns merit of performing Vajapeya Yagna. The puja and donations the day puts and end to the bad karma associated with all sins committed in previous births. A person performing puja on the day will become famous and will be honored. How to Perform Puja on Vaman Jayanti? Clean the house and take bath in the morning. The puja can be performed in the morning or during noon time - Abhijit Muhurta. Place the murti or picture of Vamana Avatar of Vishnu on the northeast corner of the house. Dhoop or agarbatti should be of jasmine flowers. Offer red and yellow color flowers. Offer apple or red color fruits. Chant the mantra वं वामनाय नमः॥ 108 times. The legend of Vaman varies from region to region. In some regions, Bali is portrayed as an egoistic demon king and in some regions he is a kind-hearted king. What is common in all legends is that Indra and other Devas had lost their power to King Bali and takes refuge at Vishnu’s feet. King Bali was an ardent devotee and was only happy to surrender before Vishnu and attain Moksha. During the same period the people of Kerala celebrate Onam, the annual visit of King Bali who was pushed to the netherworld by Lord Vamana. The reign of King Mahabali is considered to be the golden era. There were no lies, cheating, poverty – it was utopia in reality. Due to this the demon King Mahabali ruled the entire universe and the Devas (Demi gods) had lost their power. Lord Vishnu had to intervene to save the Devas. He took the form of dwarf Vamana and attended a yagna being conducted by King Bali. Vishnu in this form is also known as Trivikrama. During the yagna, Mahabali made an announcement that he will fulfill any wishes made by anyone. Vamana was waiting for this opportunity and asked him to grant as much land as he could cover in three steps. Mahabali granted the request thinking how much land the dwarf can take using three steps, when he has the entire universe in his disposal. Suddenly, Vamana took a gigantic form and in one step covered the whole heaven, and with the second step the earth and netherworld (Pathalam). As there was no more space left to keep the third feet, Mahabali lowered his head and Vamana placed his foot on it and sent Mahabali down below to rule the netherworld (Pathalam). Pleased with the sacrifice and devotion of King Bali, Lord Vishnu gave a boon to Mahabali. King Bali asked that he be allowed to visit his people once in a year. Donate honey to a Vishnu temple for good health. Include drumstick leaves in food three times a day for a year. For success in life, feed a cow with yellow color bananas. To overcome problems in marriage, light 12 lamps in a Vishnu Temple. For peace, prosperity and financial success, plant a drumstick tree and take care of it.